An earthquake with a magnitude of 7.8 struck Nepal in 2015, and the country may still face the threat of much stronger quake, according to new research. In April 2015, a powerful tremor struck Nepal—and especially the region around the capital city, Kathmandu. An earthquake with a magnitude of 7.8 destroyed entire villages, traffic routes, and cultural monuments, with a death toll of some 9,000. However, the country may still face the threat of earthquakes with a magnitude of 8 or more. A group of earth scientists reached this conclusion based on a new model of the collision zone between the Indian and Eurasian Plates in the vicinity of the Himalayas. Using this model, researchers have now performed the first high-resolution simulations of earthquake cycles in a cross-section of the rupture zone. “In the 2015 quake, there was only a partial rupture of the major Himalayan fault separating the two continental plates. The frontal, near-surface section of the rupture zone, where the Indian Plate subducts beneath the Eurasian Plate, did not slip and remains under stress,” explains Luca Dal Zilio, who works in the group Taras Gerya leads at the Institute of Geophysics at ETH Zurich. Dal Zilio is lead author of the study in Nature Communications. Tremors of the magnitude of the Gorkha earthquake release stress only in the deeper subsections of the fault system over lengths of 100 kilometers. In turn, new and even greater stress builds up in the near-surface sections of the rupture zone. According to the simulations the researchers performed, it would take two or three further Gorkha quakes to build up sufficient stress for an earthquake with a magnitude of 8.1 or more. In a quake of this kind, the rupture zone breaks over the entire depth range, extending up to the Earth’s surface and laterally—along the Himalayan arc—for hundreds of kilometers. This ultimately leads to a complete stress release in this segment of the fault system, which extends to some 2,000 kilometers in total. Historical data show that mega events of this kind have also occurred in the past. For example, the Assam earthquake in 1950 had a magnitude of 8.6, with the rupture zone breaking over a length of several hundred kilometers and across the entire depth range. In 1505, a giant earthquake struck with sufficient power to produce an approximately 800-kilometer rupture on the major Himalayan fault. “The new model reveals that powerful earthquakes in the Himalayas have not just one form but at least two, and that their cycles partially overlap,” says Edi Kissling, professor of seismology and geodynamics. Super earthquakes might occur with a periodicity of 400 to 600 years, whereas “medium-sized” quakes such as Gorkha have a recurrence time of up to a few hundred years. As the cycles overlap, the researchers expect powerful and dangerous earthquakes to occur at irregular intervals. They cannot, however, predict when another extremely large quake will next take place. “No one can predict earthquakes, not even with the new model. However, we can improve our understanding of the seismic hazard in a specific area and take appropriate precautions,” says Kissling. The two-dimensional and high-resolution model also includes some research findings that were published after the Gorkha earthquake. To generate the simulations, the researchers used the Euler mainframe computer at ETH Zurich. “A three-dimensional model would be more accurate and would also allow us to make statements about the western and eastern fringes of the Himalayas. However, modeling the entire 2,000 kilometers of the rupture zone would require enormous computational power that not even the supercomputers at the CSCS can provide,” says Dal Zilio. 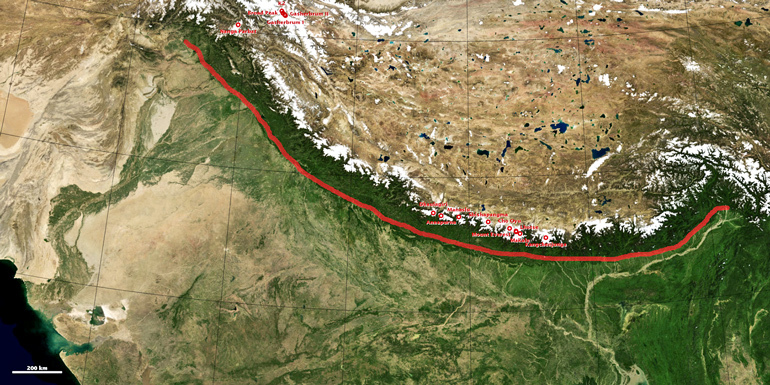 Nepal lies at the point where two continents meet: India and Eurasia. It is here that the Indian Plate subducts into the mantle beneath the Eurasian plate. Due to the suction effect the Indian Plate exerts as it sinks into the mantle, the Indian subcontinent moves north by up to 4 centimeters a year. As a result, the plates rub against each other over the length of this 2,000-kilometer fault system, allowing considerable amounts of stress to build up. During an earthquake, the sudden release of this stress causes an abrupt displacement of the plates next to each other. This is why Nepal and the southern foothills of the Himalayas repeatedly experience very powerful earthquakes.